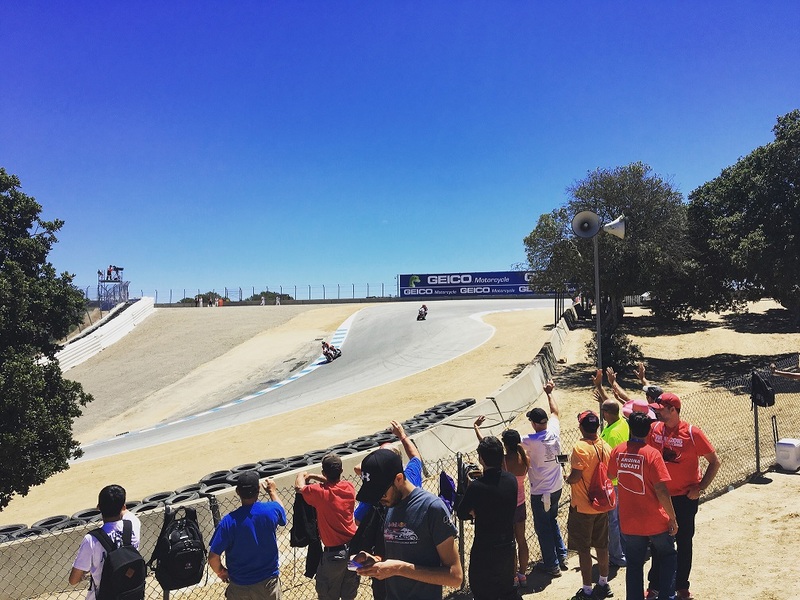 Racers have been making history on the Laguna Seca International Raceway since 1957. Nestled just east of Monterey Bay in Northern California, half the reason to make the trek is for the gorgeous scenery and roads leading to the area. So, if you’re a newbie like I am, what can you expect from such a trip, and what exactly should you remember to keep in mind? Having never been to this track or international races, I was beckoned to the road! Opting to take Highway 1 as much as I could from Los Angeles, I was constantly cooing about the beautiful cliffs and bright blue ocean views climbing up through Big Sur’s perfectly twisted roads. Leave yourself some extra adventure time— there are too many lookout points and restaurants to just blast through in one day like I did. If you want to camp in the area, reserve space ahead of time… they go fast. 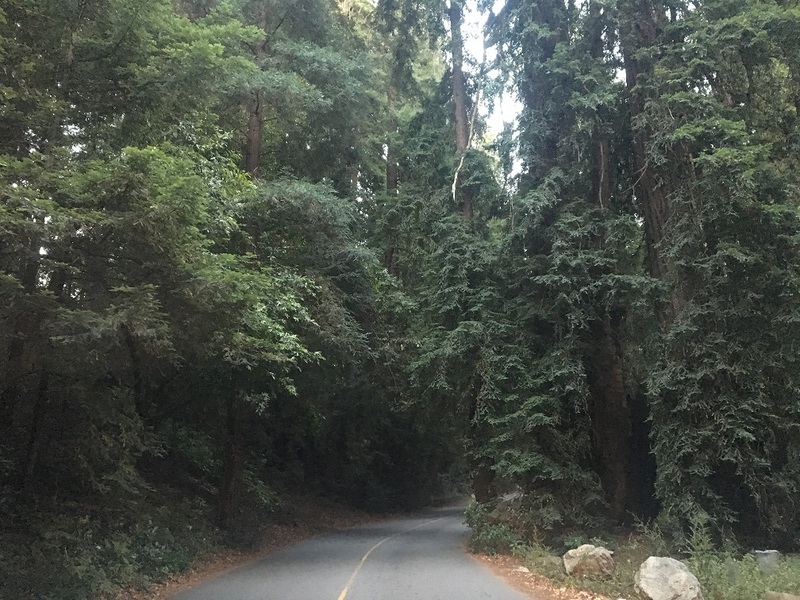 My road trip was very last minute, so I arrived at the Pfeiffer Big Sur State Campground around 7pm to meet up with friends, who had thankfully secured a space the night before. Campfires are not allowed in the majority of California because of the prominent danger of wildfire, so I was pleasantly surprised to find a big fire pit and grill set up next to a heavy duty picnic table. 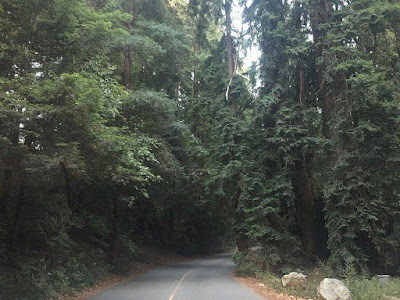 The campground has a lodge/hotel, convenience store, pay showers, and “real” bathrooms, all while sitting on the Big Sur river surrounded by beautiful hiking opportunities on the edge of the Redwood Forest. Friday morning we excitedly popped out of bed, stuffed some food in our faces, packed up camp, and headed north to Monterey (a little over 30 miles up breathtaking coastline roads). This is where you need to gas up and get ice, food, snacks, beer… the works. 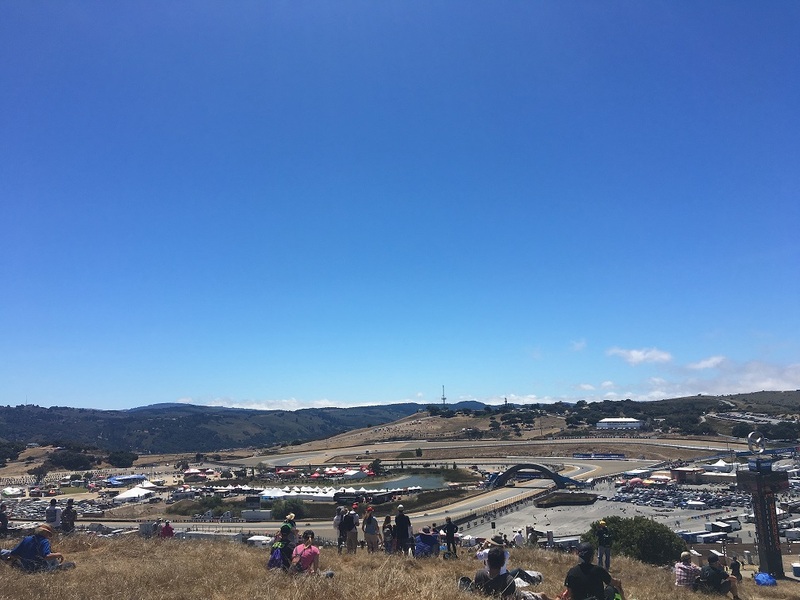 From Monterey, the Mazda Raceway Laguna Seca track is twenty minutes east into the hills. We rolled in some time around 4pm, asked who we needed to talk to about available camping spaces, and were sent to turn 11 on a treasure hunt. 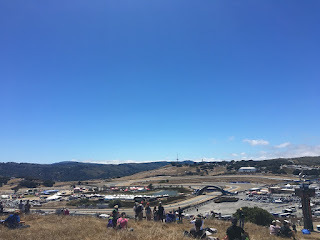 A short while later we had secured two camping spots, got our tents set up, and started off to wander the grounds to watch warm-up laps and qualifiers. Having planned nothing, everything went so smoothly... it seemed almost too easy! 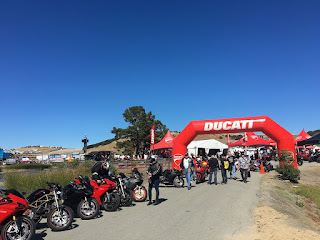 The best part about camping at the track is that you wake up to the incredible sounds of performance motorcycles, surrounded by like-minded race fans excited to watch history be made. There’s an indescribable buzz created by people's passion for motorcycles, as well as the speed machines circling the track… instant and constant goosebumps! If you choose to camp on track, prepare to walk 10-20 miles throughout the weekend. Mini bikes, bicycles, or even your motorcycle will help you get around more quickly (and avoid blisters). 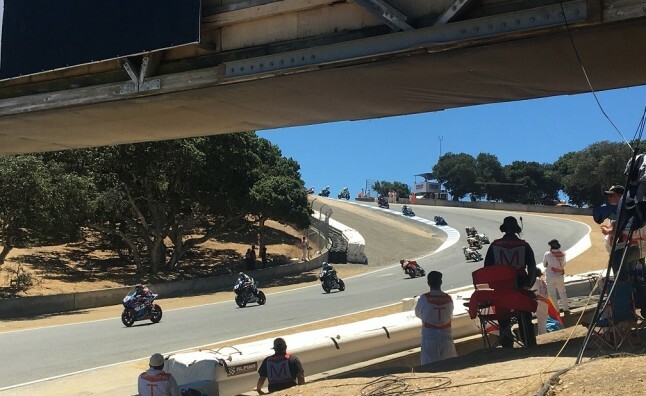 One of the biggest draws of the Laguna Seca track is the infamous Corkscrew— a series of turns starting with a blind crest in a big left hander, dropping 59 feet (that’s almost six stories) in just 450 feet of track, before changing directions completely. 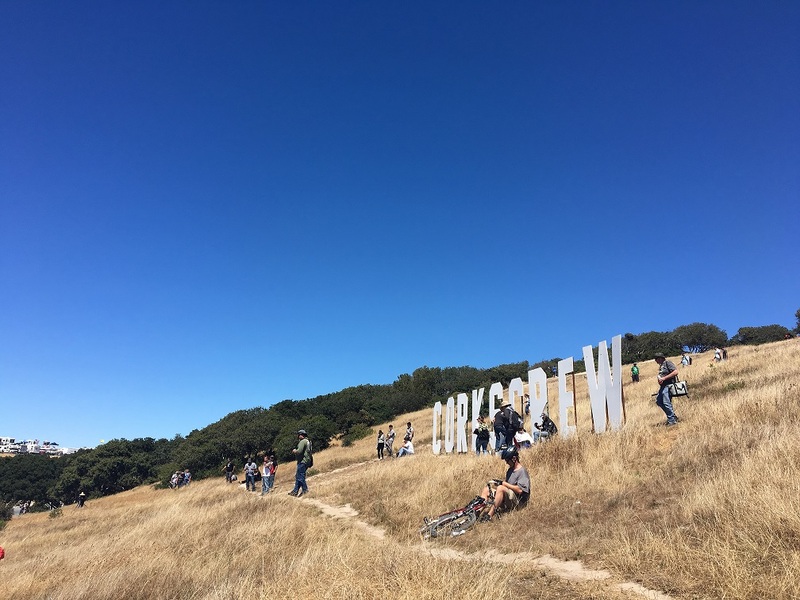 Libations and carnival style food are available atop the dusty hill, where you’ll find most of the race watchers planted. From one side of the Corkscrew hill you can watch riders blast through one of the most exciting corners in the world, and from the other side you can see every other turn on the track. 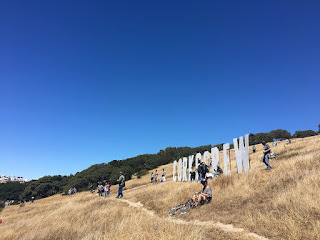 There’s no actual structured seating up there, so bring a blanket or a folding chair to avoid stickers from the dry grass. Navigate the Sea of Booths! 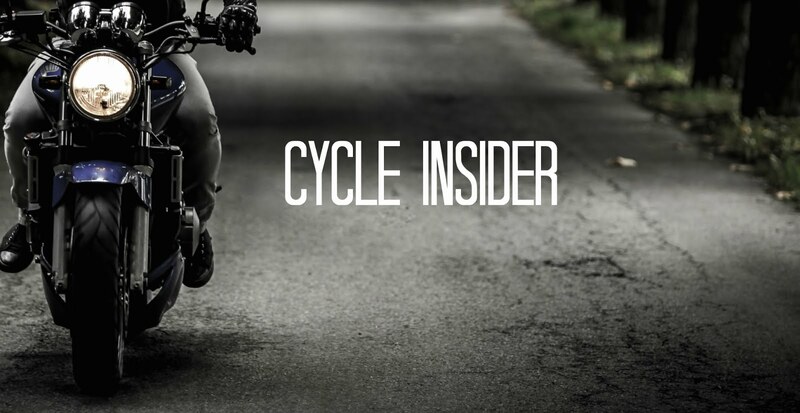 Down below you’ll find hundreds of booths and kiosks peddling their wares, with steep discounts and tax breaks— everything from the top new motorcycle technology to $5 t-shirts and figurines. Every major manufacturer (and some smaller ones, too) rolls out their model line-ups for display and demo rides. 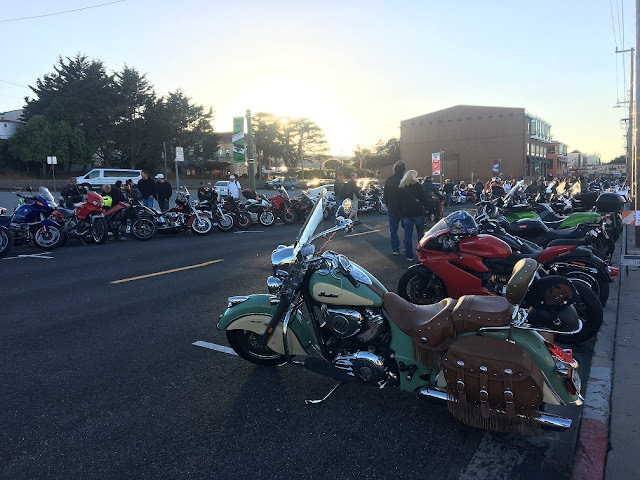 There are plenty of booths offering free services and contests to enter, like the kings of motorcycle law: Russ Brown Motorcycle Attorneys. Join BAM, their free breakdown & legal assistance program, and you’re automatically entered to win a 2016 Indian Dark Horse. It’s a win-win! 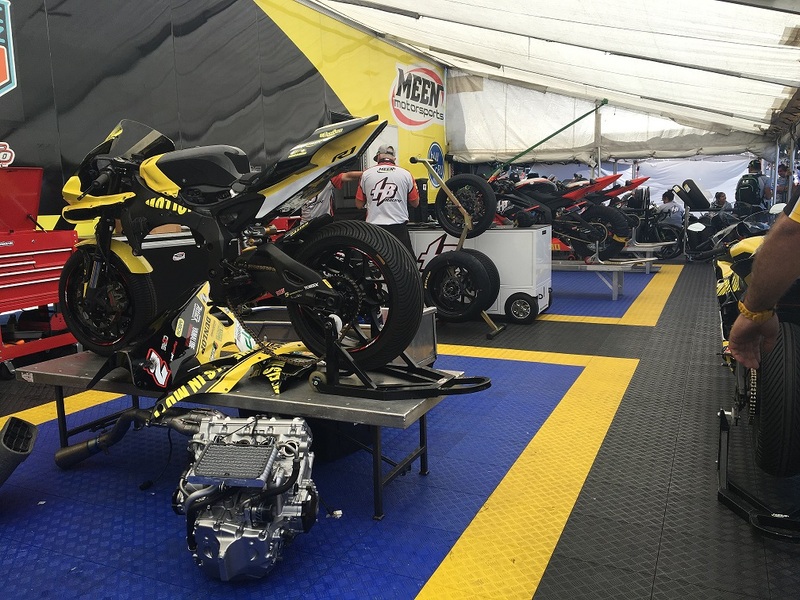 You get to see one-of-a-kind race bikes up close and in person, talk to racers, watch them spray each other with champagne on the podium… the list goes on and on. No matter where you’re standing, when the racing starts, you’re in for a treat. The sound echoing off golden ridges encompassing the 2.238 mile, 11 turn track can make a race fan a little emotional. It’s a visceral experience that can only be understood by doing. add Laguna Seca racing to your list of must-see motorcycle events. Three days of beautiful scenery and amazing motorcycles, exciting racing and a historical element that feeds the overall energy and wonder of the weekend.